I’m sorry to say, that this Flash Friday I’ve failed you. 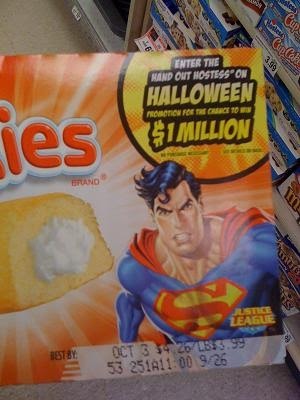 You may not have seen it yet, but Hostess is teaming with the Justice League this Halloween. Not only are there contests and such involved but two character who don’t usually get special merchandise get their own snack cakes. Yes, there are now Flash Cakes and Green Lantern Glow Balls. Sure, when the movie comes out we’ll be drowning in GL stuff, but right now it is still kind of cool. 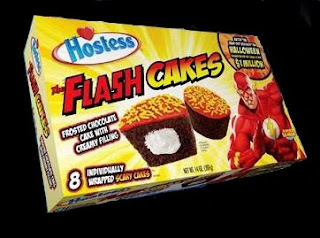 I had made it my mission last night to hit ever grocery store I could in search of Flash Cakes so I could review them for the site. Not the Glow Balls though, I can’t stand cocoanut. Sorry GL. But as I said at the top, I have failed you. Target, Wallmart, Publix, Albertsons, and Winn Dixie all came up short. I found Batman on boxes of cup cakes. 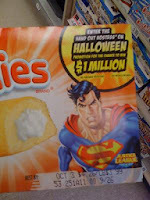 I found Superman on boxes of Twinkies. But there was no Green Lantern or Flash to be found. Years ago I had a friend that was I huge action figure collector. He also worked as a disturber for a reptile and tropical fish breeder, so he would drive all over the state of Florida making deliveries to different stores. There were times I’d go with him and during the stops we’d make toy runs. Literally stop at a Toys R Us or Target, go in, look for that rare short packed figure, and then come out all in like 5 minutes. 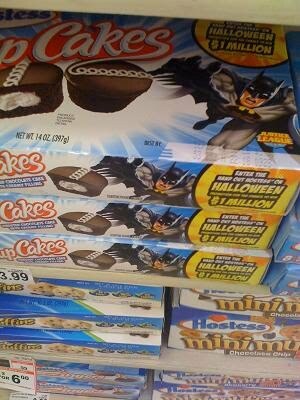 I never in a million years thought I’d be doing that for snack cakes. I haven’t given up though. As Halloween gets closer, I’m sure they will start showing up more. I promise, I will have a more detailed Flash Friday about these things. Now it has become a challenge. But more importantly I think it is a celebration of a character that is usually overlooked when it comes to products meant for a non-comic reading audience. I realize it is a small thing, but sometimes it is the small things that make you happy. There's a Wonder Bread / Hostess outlet not far from me that I forgot about, but found with the Hostess locator http://www.bakeryoutlets.com/storelocator.asp . I'm banking on them having it. Pop in your zip and see if there's one near you. Sadly nothing near me. But thanks for the link. I figure I'll run into them eventually.